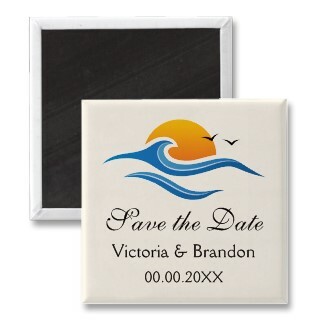 Elegant wedding Save the Date magnet featuring a tropical wave in front of a rising or setting sun and two flying bird silhouettes on a cream colored background. Great for tropical destination weddings or sea themed weddings. Click on the image for details. This entry was posted in Save the Date, Save the Date magnets, WEDDINGS and tagged Custom save the date magnets, Personalized save the date magnets, Unique save the date magnets, Wedding save the date magnets. Bookmark the permalink.